The Vancouver Canucks would like to put 2015-2016 behind them. They finished the season with a 31-38-13 record, good for sixth in the Pacific Division and 13th in the Western Conference. The Canucks had the second-worst offence in the NHL, scoring just 191 goals. They allowed a miserable 243 goals against. Once again, the majority of the scoring came from Daniel and Henrik Sedin. Daniel came up with 28 goals for a total of 61 points, while Henrik registered a team-leading 44 assists for a total of 55 points. Jannik Hansen was second in goal-scoring with 22, while Bo Horvat chipped in for 40 points and finished third on the team in scoring. In order to address the lack of offence, the Canucks went shopping and came up with Loui Eriksson. The 31-year-old Swede has experience playing with the Sedin twins on the national team, so the hope is that the combination will pay off. Defensively, they lost Dan Hamhuis but gained Erik Gudbranson. That should bulk up the blueline, which in turn should help them contain the puck. The Sedin twins drive the majority of offence in Vancouver, but that may be a problem as they grow older. Daniel is the goal-scorer and he averaged 18:20 of ice time a game last season, with 258 shots on goal. Eight of his 28 goals came on the power play, where he’s able to generate chemistry with Henrik. Henrik is the playmaker. He averaged just two seconds more of ice time a game than his brother last season, which illustrates just how often the twins play together. The 36-year-old plays a seasoned game and is an excellent set-up man, especially when Daniel’s on the ice. Henrik doesn’t shoot as often as he should, but his defensive side covers any gaps. Eriksson had 63 points last season with the Boston Bruins. 10 of his 30 goals came on the power play. The 31-year-old plays an intuitive game and can shift his focus to defence without missing a beat. Eriksson averaged 19:28 of ice time a game and had 184 shots on goal. He also accounted for five game-winners and two short-handed markers. 27-year-old centre Brandon Sutter will be looking to make the most of a full season. Injuries limited him to 20 games last season, where he came up with a reputable nine points. Horvat could give Sutter a run for his money down the middle. The 21-year-old put up good numbers last season, with 40 points in 81 games. He averaged 17:07 of ice time a game. Alexander Edler had 20 points in 52 games last season and averaged 24:27 of ice time when he was healthy. The 30-year-old Swede scored three of his six goals on the power play and cracked off 111 shots on goal. He plays a complete brand of hockey and can take the edge in one-on-one situations, but he can also cough up the puck when the pressure’s on. Chris Tanev has emerged as one of the finest defencemen on the roster. The 26-year-old had 18 points in 69 games. Two of his four goals came on the power play and he averaged 21:45 of ice time a game, with 42 shots on goal. Tanev moves the puck well and plays a compact overall game, but he lacks a physical side. Ben Hutton is another up-and-coming blueliner and Canucks fans are already in love with him. The 23-year-old is an affable presence and he managed 25 points in 75 games last season. He could play with Gudbranson, who owns a monstrous physique at 6’5, 216 pounds. He had nine points in 64 games and has a crackerjack point shot. Ryan Miller posted a 17-24-9 record last season, with a 2.70 goals against average and a .916 save percentage. He registered one shutout. The 2009-2010 Vezina winner has seen better days, but the Canucks want the 36-year-old to handle the majority of the starts. Miller will give the team a chance to win and he anticipates well, but wear-and-tear can be an issue down the stretch. Vancouver is hoping that Jacob Markstrom will take the top job eventually, so the 26-year-old Swede could see quite a few more starts this season. He is a huge netminder at 6’6, plus he’s quick for his size. He went 13-14-4 last season, with a 2.73 goals against average and a .915 save percentage. Jim Benning believes in his prospect pool, even if few others do. Defenceman Nikita Tryamkin is set for arrival in 2016-2017. The 22-year-old already has four years of KHL experience and he skated in 13 regular season NHL games last year, where the 6’7 blueliner proved a lofty presence. Anton Rodin is also a potential arrival this season. The 25-year-old Swedish winger has been skating with Brynas in his home and native land and put up solid numbers, with 37 points in 33 games. His season ended in mid-January due to a scary injury, but Rodin still managed to win the league MVP award. 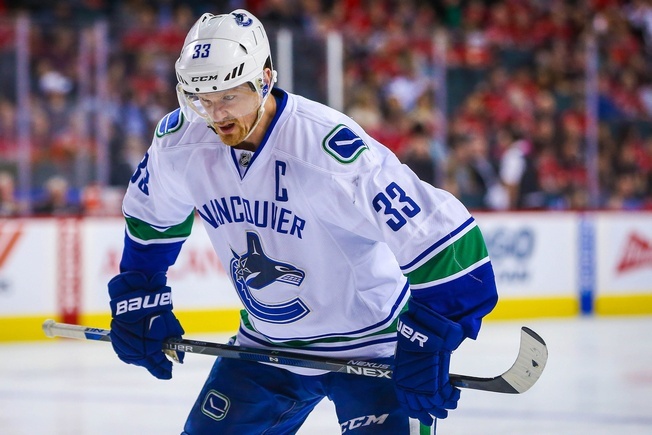 The Sedins will once again shoulder the scoring load, but they’ll have help from Eriksson. There’s some appreciable depth with Horvat, Sutter, Hansen, and even Sven Baertschi, but goaltending may be an issue if Miller runs out of gas. Goal-scoring will be the biggest challenge. Realistically, the Canucks will miss the playoffs – again.